The 1983 film, El Norte, directed and written by Gregory Nava, has never been more timely than it is today. The movie is about peasants escaping "mindless labor and a murderous Guatemalan government" with the desperate hope of finding a better life in the U.S.A. I blogged recently about the Kevin Cline film, Trade, and how it connects to the recent report that many women flee from cartel sexual violence and slavery to seek refuge directly from U.S. Border Patrol guards. This may be the best time to reconsider our priorities regarding the American migrant crisis at our Southern border and to acknowledge the fact that the issue won't go away but will only escalate further into chaos and disorder--a fundamental law of physics and, now, sociology. 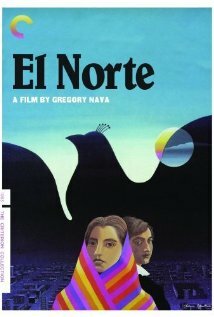 What's most compelling about El Norte is the loyalty and love portrayed between actors David Villalpando (The Mask of Zorro) and his fictional sister, Rosa, played by Zaide Silvia Gutiérrez. Their dream is simple: Get to the States and find a job as a waiter for Villalpando in a classy restaurant and be respected for an ordinary job extraordinarily done. However, deception, disease and death wait for them along every step of the way on their journey to "el norte" resulting in a nightmare of recurring horror. Poverty and oppression not only accompanies them on their tragic journey, it mocks them into a demeaning submission that is no where near the lesser of two evils. Sadly, hostile forces within their element have hijacked their hopes and made them a threat to America's sovereignty.